"It's a Bird It's Plane It's Superman" ran for 129 fun and energetic performances on Broadway. The New York critics loved the show, as did the audiences. The show was electric and exciting, and Bob Holiday was fabulous as Superman. 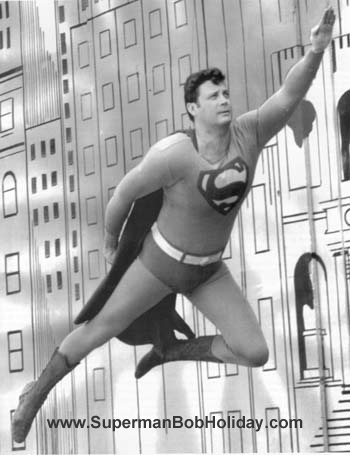 One sign of the sheer joy of It’s a Bird It’s a Plane It’s Superman, is that the very next summer, in 1967, not one, but two revivals were staged. 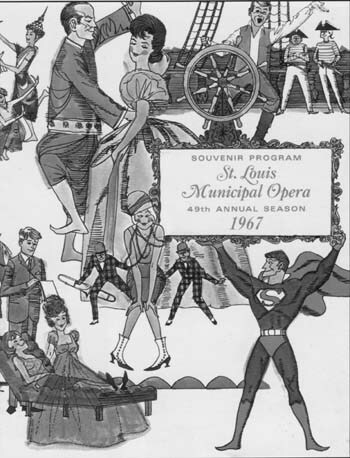 The St. Louis Municipal Opera and the Kansas City Starlight Theatre each reached out to Bob Holiday (and his massive Kryptonian singing voice) to reprise the role of Superman, this time in the great state of Missouri. It was a grand summer for Bob, who took to “the cape” with the same generosity and enthusiasm that he’d shown in New York. 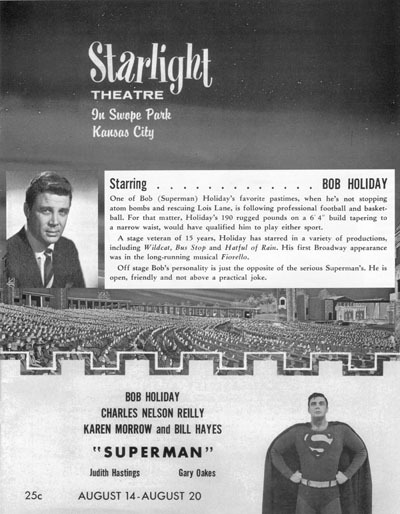 As Bob said in his book, Superman on Broadway, “I was thrilled to be playing Superman again, and was really looking forward to these shows.” Audiences in Missouri were equally excited; opening nights each saw over 10,000 people in attendance. It wasn't just the "shows" that Bob was looking forward to. He continued to recognize how important Superman was to children everywhere. 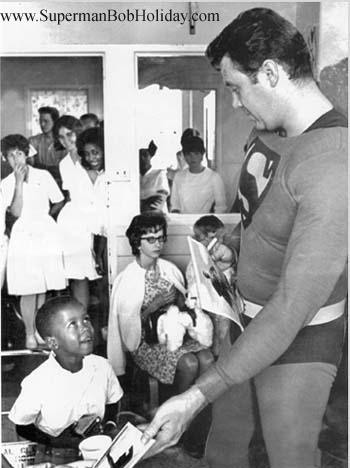 He took time to reach out to the children of St. Louis who were most likely to be helped by meeting Superman. He left each child with an autographed photo, and spent time visitng with each and every one. It was a special time for Bob, too. Before the show opened in St. Louis, I made a personal appearance at the Cardinal Glennon Memorial Hospital for Children. This was my work and my reward. It always has been and will always be. To meet children, and give them a moment with "Superman," was a real privilege. I later received a nice letter from the hospital, thanking me for coming and how much it meant to the kids. Notice that it wasn't just the children who were enthralled by Bob Holiday as Superman. Take a peek at the nurses and mothers in the background. They were every bit as taken with Bob Holiday's Superman as the little ones! 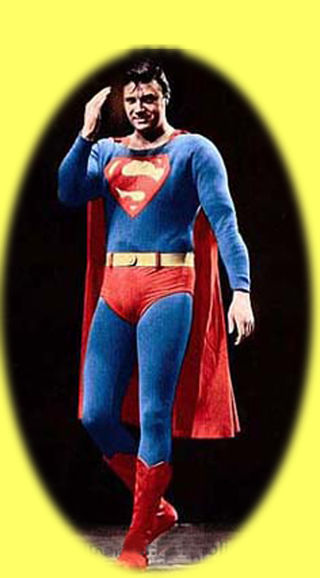 At least two flight mishaps took place during the Broadway run of "It's a Bird It's a Plane It's Superman". Once, a stagehand dropped Bob's flying wire so that it swung out across the stage. More frightening, the shackle on Bob's harness broke one night, dropping him six feet onto the stage. 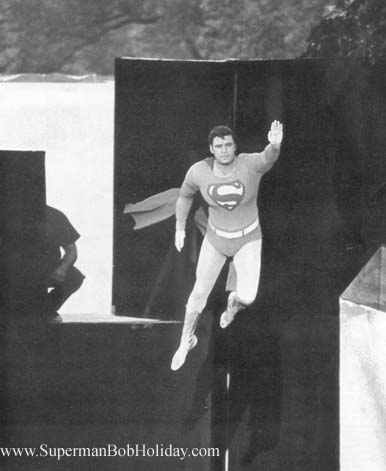 Both these events were handled with Bob's usual good humor and aplomb, but it helps you realize how courageous Bob was to play Superman in new OUTDOOR venues. The Municipal Opera was an open air theatre that seated over 10,000 people. Since there wasn't a ceiling, the pulley system to make me fly was not feasible. The producers of the show rented an industrial sized crane that was stationed behind the theatre. At times, I would be flying a couple of hundred feet in the air. This was much higher than I had flown on Broadway. I must confess that I was a little nervous in rehearsal, but everything worked out smoothly, and it was great fun to soar over the stage. Apparently, Lois Lane was not the only female reporter amazed by Superman's feats. Lynn Hawkins of the St. Louis Globe Democrat wrote this glowing report on Superman ... er, Bob Holiday. The man "faster than a speeding bullet" who "can leap tall buildings in a a single bound" also managed to stop five lanes of traffic by a single move on a busy St. Louis street. Some motorists allegedly not only refused to speculate on how he got there -- but whether that really WAS Superman standing in the center of the street, arms outstretched, signaling cars to stop. One man supposedly was seen getting out of his car and rubbing his eyes and shaking his head. Others simply sat in their automobiles dumbfounded. It took a bright-eyed boy about 10 years old to lean out of a car and shout, "Hi, Supie, what's new in Metropolis?" "Just trying to get across the street, sonny," the superhero called back as he motioned to five Cardinal baseball players still waiting on the curb that it was now safe to cross. Only those motorists who know that Superman is starring in the Municipal Opera production this week weren't too surprised to see him, even in the middle of a busy thoroughfare. And those who know Bob Holiday personally aren't too surprised at anything he does. The crowds in Kansas City were just as large as those in St. Louis. I also "flew" from a huge crane again, and they again went crazy when I made my entrance. They did bring a lot of kids out onstage with hula hoops. I don't know why the producers did this, but it was a great finale at the end of the first act. No one may remember that he has a good voice (he does ...), but lots will recall his open-faced delight at public adulation ... at the end of act one. And his airborne exits on wires, while he assumes just the right Superman flight position. 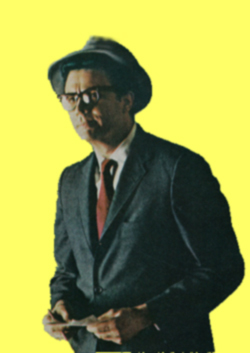 And his supremely square Clark Kent, who always looks a bit embarrassed when required to peel off his street clothes. And his woebegone crushing of a coffee table when he finds himself out of public favor.